Thanks so much for the enthusiastic response to this giveaway of two tickets to the Newport Mansions Wine & Food Festival. We received 20 entries via comments, and another 13 via email. "My husband and I would love to have the opportunity to attend! We love food and wine!" Congratulations Elizabeth! Please email me at wellesleywinepress@gmail.com to claim the prize. 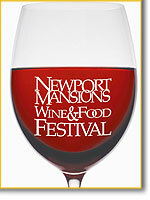 For more information on the event, visit the Newport Mansions Food & Wine Festival website. In general, domestic Pinot Noir is lighter in body and color than Cabernet and Merlot. However, some producers produce it in such a ripe fruit-forward style it bears little resemblance to lighter Burgundy or even Oregon Pinot Noir. But that's not the case across the board. A small but growing group of winemakers are committed to producing California Pinot Noir that lets the site speak for itself. I'll call these producers terroir-driven. And as such, their wines are leaner in style. The best succeed in producing balanced, compelling wines that speak to where they were produced and at the same time are an absolute pleasure to drink. Ted Lemon seems to have found the perfect intersection of being committed to his craft in an authentic way, and producing wines that are truly pleasurable to drink. Crazy-committed to biodynamic and all that - it's a wonder the wines aren't more expensive. Their appellation wines list in the high $30s, and the single vineyards go for closer to $60. Availability: I've seen these around at retail occasionally, but they disappear quickly. You wouldn't know it from Wine-Searcher.com but The Urban Grape is the place to buy them in Massachusetts. Guidance: Absolutely seek out and try Pinot Noir from Littorai. Great Chardonnays too. Rhys Vineyards is the poster child for a leaner direction in California Pinot Noir production. That being the case, they can be polarizing. They're the opposite of Kosta Browne. My experience with their wines has been mixed. I've enjoyed their sub-$40 Alesia Pinot Noirs, but stretching further into some of their ~$60 single vineyards hasn't necessarily paid off. Some say they need time, but I couldn't see the 2009 Family Farm, for example, turning into a swan. That said, I could see the quality in the 2009 Bearwallow. Not my style necessarily, but I can see why they're well regarded. Availability: Almost entirely mailing list. If you see it at retail, the price is typically jacked up. Guidance: Find a friend on the mailing list and try a bottle of their Alesia to get a window into their style. If you like what you see wait on their mailing list for a long time and let their single vineyard Pinots cellar for a while before opening. 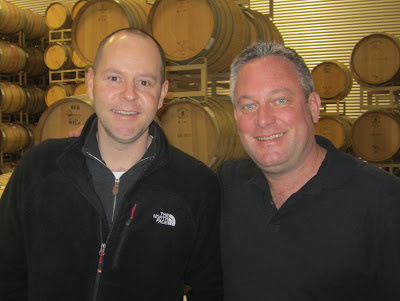 If there is a winemaker's winemaker, it's Ross Cobb. The last time I visited Sonoma, I asked winemakers whose wines they enjoyed and whose style they'd like to be favorably compared to. I was amazed how often Cobb's name came up. He also makes wines for Hirsch, Claypool (love Primus, haven't tried Les's wines yet though) and Banshee. No wonder we've all enjoyed Banshee so much! They're pricier for sure with most of their wines selling in the mid-$60s. A tough price point, but it's all here. Availability: Quite limited at retail, but I have seen it from time to time. I spotted a couple bottles at Lower Falls in Newton recently, and I even saw some appear on WTSO.com (by way of WineNabber.com) for a short time. Guidance: Worth seeking out and tasting. A benchmark for high end California Pinot Noir. Here's a producer who, I'm told, started out making bolder wines but is now firmly committed to producing more restrained Pinot Noir. Perhaps similar to Rhys, I loved the more affordable 2010 Sonoma Coast ($39) but the 2009 Savoy ($50) was less impressive. All things considered the price points are quite reasonable if you can buy them without a markup. Availability: Very hard to find at retail near release price. Guidance: I'm looking forward to trying more of these. Hop on their mailing list and have patience. The most famous Red Car bottling is actually a bit of a head fake. Their 2007 Heaven & Earth La Boheme graced the cover of Wine Spectator with a massive 97 point score. But it's not representative of their house style at all. The rest of the wines in their portfolio are far more restrained and they are absolutely a lower alcohol producer committed to producing wines that deliver a compelling experience without being overly ripe. Availability: You do see these around at retail, so have a look on Wine-Searcher.com. Guidance: Try the Heaven & Earth if you like a more fruit forward style, and compare them to other bottlings. Is Rhys the Next Cult California Pinot Noir? Question of the Day: Who are some of your favorite terroir-driven California Pinot Noir producers? An unfortunate but expected update from Free the Grapes: Massachusetts House Bill 1029 won't be passed this legislative session. First introduced in 2011, the bill provided a framework for the direct shipment of wine from out of state wineries direct to Massachusetts residents. A 2010 federal court ruling determined the state's current laws were unconstitutional because they discriminated against large wineries. HB 1029 would have lifted this large winery restriction, established mechanisms for licensing out of state wineries, provided a means for excise tax collection, and perhaps most importantly, defined a reasonable fee structure for FedEx and UPS to ship wine within the state. It's back to the drawing board. Expect a new bill to be introduced in 2013. The legislative session in Massachusetts runs for two years so let's hope a new bill can be introduced that provides not only for winery direct shipments but for retailer shipments as well. In talking with my state representative about this issue, I learned that they're not hearing from a lot of consumers about their support of direct shipment of wine. Send your representative a sincere email asking where they stand on the issue and ask them to help push the issue along at every opportunity. Don't know who your representative is? A list can be found here. Also consider dropping Representative Theodore Speliotis an email expressing your displeasure with the fact that committee he chairs failed to act on this bill for two years. Ironically, the committee is named the Joint Committee on Consumer Protection and Professional Licensure. As a consumer I hardly feel protected by the lack of passage of this bill. In fact I feel like my rights as a consumer are being trampled upon in favor of a few who want to keep Massachusetts in the dark ages of commerce. This offer has expired but if you're looking to save money at Wine.com try using the Double Dip Trick. Wine.com is offering half off their Steward-Ship program through Sunday August 26th with code "SSAFF". Steward-Ship is kind of like Amazon Prime. For a flat rate of $49 ($24.50 with this offer) Wine.com will ship wine to you for a year. Steward-Ship can also be used to ship wine and gift baskets to other addresses since it's tied to your account rather than a single receiving address. I've had Steward-Ship for a couple years now and, especially when you can get it for half off, it's a good deal. What I like about it is how it enables quick shipment of just a bottle or two without having to fret about building towards a mixed case to reduce the per-bottle shipping costs. Like last week when I wanted to get a bottle of 2010 Cosme Gigondas shipped out here. Other retailers had it for a few dollars less. But none would ship a single bottle out for free. So Steward-Ship worked nicely. Yes, Wine.com's prices are a little high compared to other retailers. But if you keep your eye out for coupons and especially half off vouchers they've run the past couple years, a year's worth of wine shipments for $24.50 is a nice deal. You can buy Steward-Ship now without place a wine order. Just add Steward-Ship to your cart, enter "SSAFF" in the Promotional Code box, click "Update Cart" and you should see the price reduce to half off. Check out without adding any wine and your account should have Steward-Ship applied for the next year. If you already have Steward Ship active on your account, you can extend the duration of your subscription with this offer. To check when your current subscription expires, go to the Wine.com home page and Log In. Click on "'s Account->My Account" then off to the left it should say when Steward-Ship renews. If you buy Steward Ship now before your current subscription renews, your account will show that Steward-Ship renews a year from today so you'll have to call them to get it corrected. I did that. It took just a few minutes - no problem. If you intend to keep Steward-Ship going forward now is the time to buy. Last week I promised to track down and taste a bottle of the 95 point rated (Wine Spectator) $41 (release price) 2010 Château de Saint-Cosme Gigondas. As promised I ordered a bottle of from Wine.com, it arrived, and I cracked it open. Side note: It was a full-on 90F degrees the day I had it shipped. I missed the shipment and it was redelivered the next day. I popped the wine open the day after that and you know what? It was totally fine. Maybe we're getting excessively cranked up about shipping wine when it's slightly warm? I mean - this is Massachusetts, not Arizona. Another thing - people sometimes ask how Wine.com can ship to Massachusetts with all of the shipping restrictions in place here. Wine.com is the only national wine retailer I'm aware of that's taken the time to obtain a Massachusetts retailer license and buys all of their wine they ship to Massachusetts residents from Massachusetts wholesalers. I hope that also helps explain why Wine.com inventory and pricing varies from state to state. Pretty magenta/ruby in the glass. About 70% opaque. Aromatically, I get ripe raspberry, rose petals, black pepper, and other typical Rhone notes. Really pretty. Shines on the palate with a silky mouth feel up front followed by a nice tannic bite at this stage in its youth. Good dose of acidity too. So elegant and powerful at the same time. Beautifully balanced. Very nice stuff. Tremendous value. Molesworth nailed this one. I'd love it if you subscribed to the WWP to hear about fantastic wine deals. One of the more common complaints I hear from friends about Wine Spectator is that it's difficult to find highly rated wines the publication recommends. It can be tedious keeping up with for sure so we've got to help each other out. Here's one you can act on right now. When you have a Wine Spectator online subscription, you also gain early access to their ratings through their Insider and Advance newsletters. These can give you a little bit of a head start in some situations. Last week's Insider featured a sneak peak of ratings from the highly anticipated 2010 Rhones. My eyes were drawn to the big numbers for St. Prefert CdPs. But my pal @EvanDawson spotted an incredible QPR hiding behind the Chateauneufs: The 2010 Chateau de Saint Cosme Gigondas. With a score of 95 points, a release price of $41, and ample 3,300 case production - this is a fantastic quality-price ratio wine you can find at retail. Click here to buy it now on Wine.com. If you're not a Steward Ship member and haven't ordered from Wine.com before use "1CENTWELCOME" for $0.01 shipping on orders of $75 or more. In the Boston area Blanchard's has it for $34.99 and eligible for discounts. Other MA retailers have it for a little more - check Wine-Searcher.com. Or search nationally. Thanks for the heads up Evan! I ordered a bottle and will let you know how it goes when I taste it. The other day, I was listening to ESPN Radio's Colin Cowherd when he shared that he'd be doing a guest appearance on Mike & Mike with Mike Golic. I thought this was an interesting way of cross-pollinating audiences so it served as a reminder that I should be doing more guest blogging for other wine blogs. As I got to thinking about a good venue for a post about a visit to Kosta Browne, David White's Terroirist was the first that came to mind. David has been doing a tremendous job since launching Terroirist a couple years ago and I've particularly enjoyed his winery trip reports. It's no secret California Pinot Noir consumption has taken center stage here at The Wellesley Wine Press lately. But all of this research has to lead to something, right? I thought it would be interesting to share a list of producers, mostly ones I'd consider to be at least somewhat fruit-forward stylistically, who when I open a bottle of their wines I have full confidence the wine is going to be outstanding. Gorgeous stuff that shows diversity from vineyard to vineyard. La Neblina and the newly-introduced Laguna are my favorites, Alberigi is leaner in style. You'll see some availability retail but rarely at a price better than what's available winery direct. That these spectacular wines are available in the high $40s is an example of why California Pinot Noir is one of the most exciting categories in wine today. A relatively new producer from the Anderson Valley, Black Kite's Kite's Rest bottling has impressed me across a number of vintages. I tasted the 2008 blind against alongside a couple of nice Burgundies and thought to myself: "Now this is what Pinot Noir should taste like". What can I say - I love California Pinot Noir. I usually try to catch this one at specialty retailers due to tough shipping terms winery direct to the Northeast. Question of the Day: Who did I miss? Who are the California Pinot Noir producers who, when you open a bottle, you're fairly certain it's going to be an outstanding, fruit-forward, enjoyable bottle? I'd love it if you subscribed to The Wellesley Wine Press to get new posts sent to your inbox. Don't know how long this will last, but Amazon Warehouse Deals has a used (?) 6-pack of Schott Zwiesel stems for $14.10 - just $2.35 a stem. These are a great buy at $59.99, so $14 is a ridiculously good deal. The primary concern here would be what used stemware is like. I have to imagine it was something that was returned to Amazon that was in otherwise perfect condition. I've had nothing but good experiences returning stuff from Amazon that wasn't what I was looking for but I've never ordered from their Warehouse Deals. I mentioned why these glasses are a nice option in this post. Question of the Day: Any experience with Amazon Warehouse Deals? I'll update this post if I notice these glasses are gone so as to not waste your time. Like hearing about wine deals? I do too. I'd love it if you subscribed to The Wellesley Wine Press for future updates. Update: Looks like someone bought them. Follow me on Twitter (@RobertDwyer) for real-time deal updates. WineTasting.com is offering a friends and family sale with savings "up to 70% off". To see the wines offered and pricing you'll need to register on their site. I'll respect their terms and not list specific prices and comparisons to nationwide bests here, but I'll say I spotted some nice deals from producers like Davis Family, Nickel & Nickel, Whitehall Lane, Twomey, Delectus, and more. Shipping terms are quite favorable so all in all a nice sale. Question of the Day: See any nice deals there I may have missed?